Hi everyone, it’s Holly from My Sister’s Suitcase! 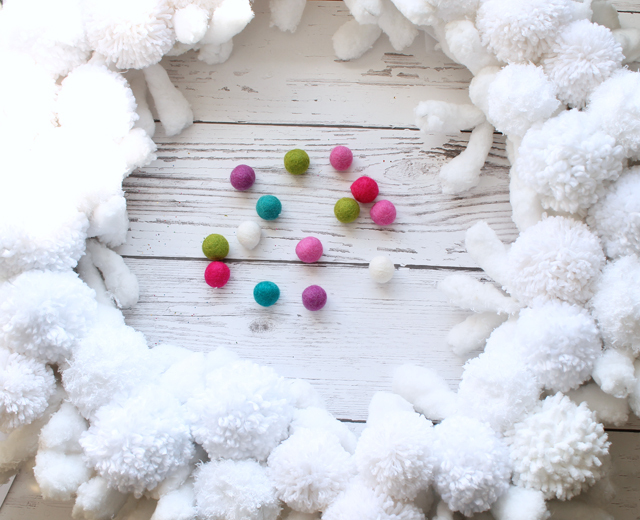 It has been such an honor to be one of Jen’s contributors this year, and I’m happy to be back this month as part of the Happy Holidays series, with a Christmas Pom Pom wreath that anyone can make! I saw a really cool, fluffy pom pom wreath at JoAnn Craft store a few weeks ago, but it was pretty expensive and it was a cream colored yarn. I needed something in white to go with my colorful snowy Christmas decor this year. Fun transformation, huh? I love how it looks with my tree too! 1. Yarn. Lots and lots of yarn! I think I used 4-5 skeins to make this entire wreath. I used different types and textures of white yarn… some regular yarn, thicker yarn, and the soft baby blanket yarn. 2. 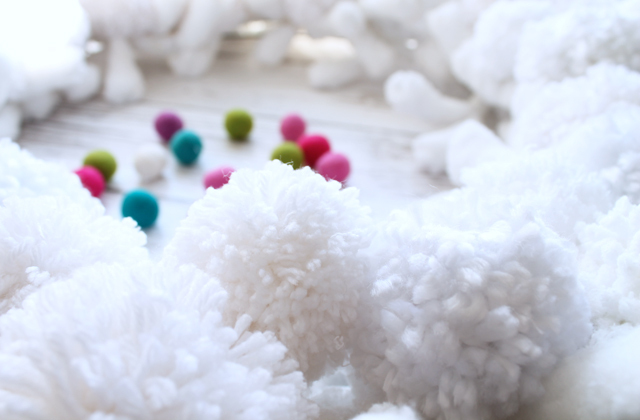 Pom pom makers. I used the large and medium sizes that come together in this 2-pack. I have used these sizes for so many projects, so it’s definitely worth $6. They make a fun gift too! The main part of this project is just making the pom poms. (And it’s the most time consuming!) I just did a few whenever I had time… watching a show, while playing a game with the kids, I even took my yarn and pom pom maker in the car for when I had a few minutes waiting. 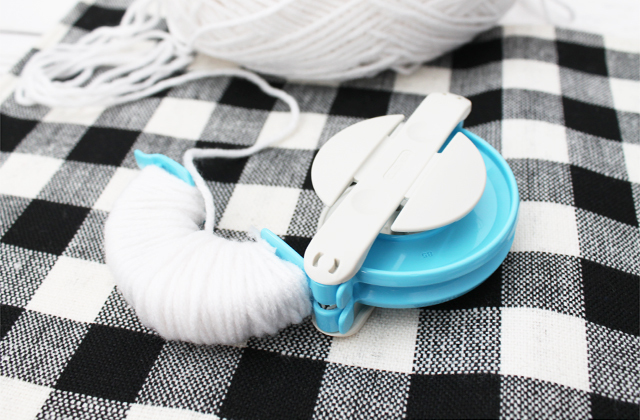 Make sure to get at least 3 layers of yarn wrapped on your pom pom maker to get a nice fluffy pom pom. 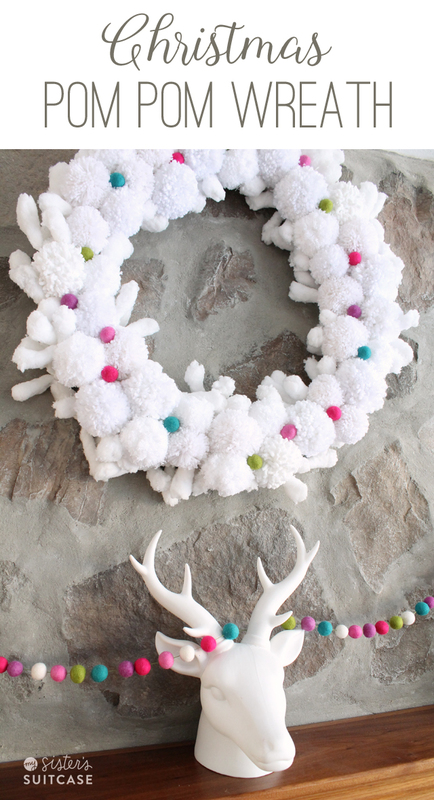 Once all of my pom poms were complete, I started placing them around my wreath form. 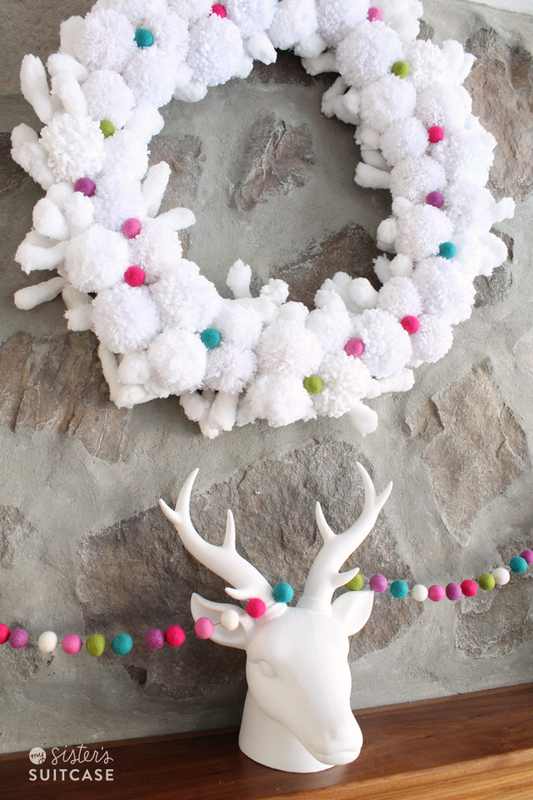 (I used 40 pom poms total for my wreath, but keep in mind, it is a HUGE wreath!) The finished wreath measures 30″ high! I’m in love with this new version of my wreath! 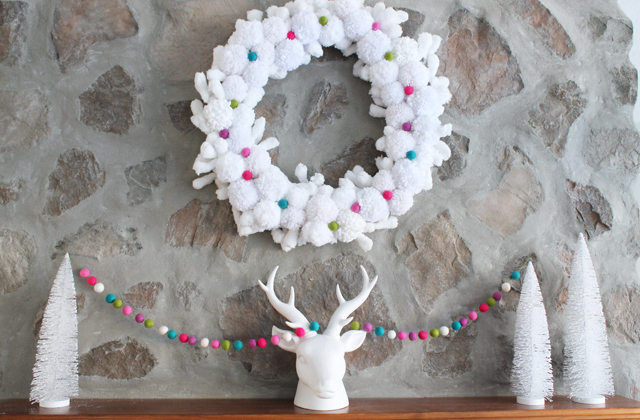 I hope you enjoyed this simple pom pom wreath tutorial, leave a comment and let me know if you decide to make one too! 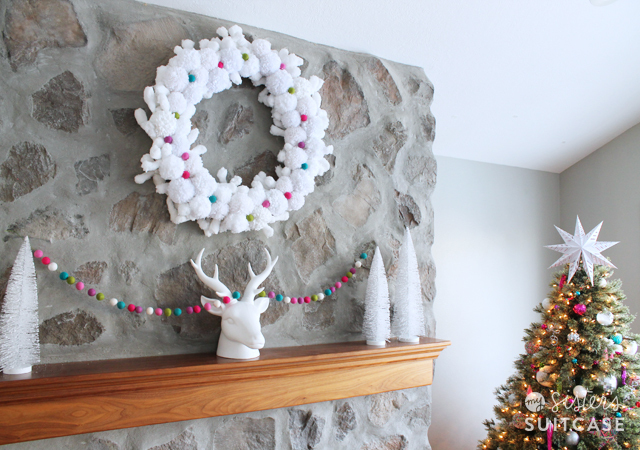 I love this DIY Custom Vintage Christmas Garland she made! So darling! And these Christmas Tell-A-Story Blocks are such an inexpensive DIY your kids will love! And here’s a cute an inexpensive Gift Idea for anyone in your circle! Oh my…..absolutely adorable!!!!! I love it. Wish I would have seen this sooner as I have a 2 1/2 hour drive ahead tonight and this would have been perfect in the car. Love the colorful garland with the deer head too. Thanks for sharing. This is adorable! I love the little pops of color in it, too. 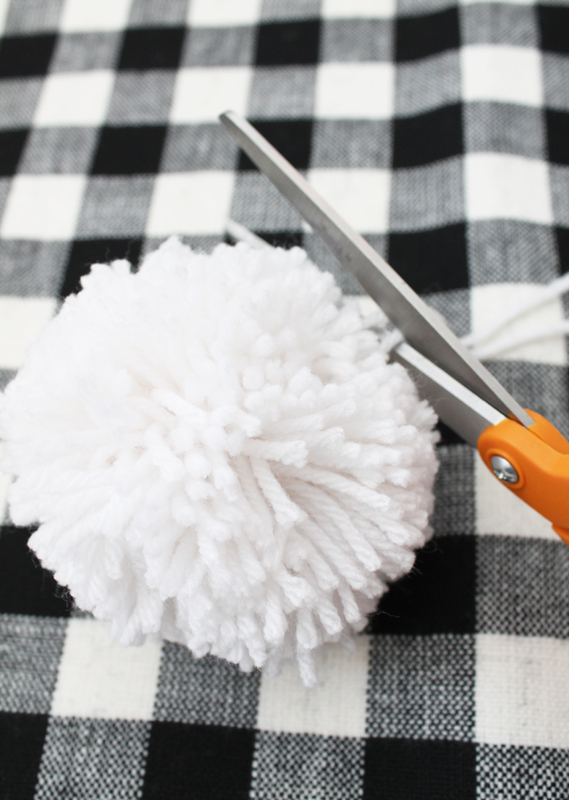 I have never heard of a pom-pom maker, lol — where have I been?! That’s pretty brilliant. 😉 Thanks so much for sharing the tutorial with us. 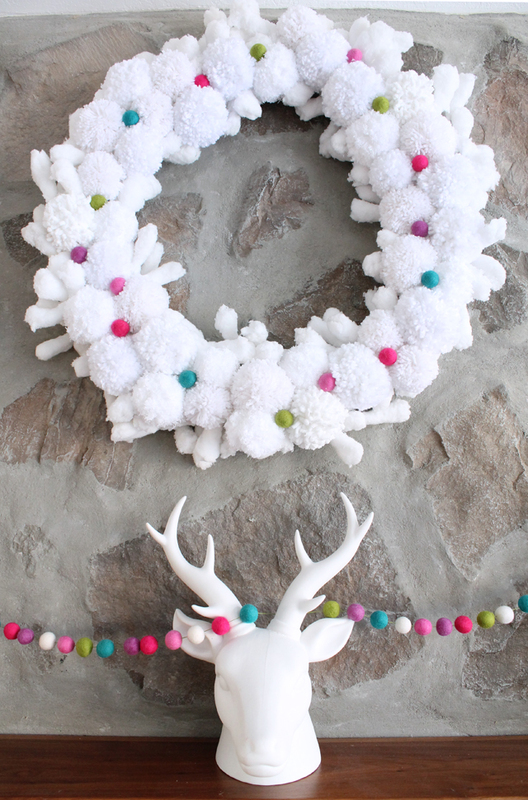 That pom pom wreath is too cute! I love it!